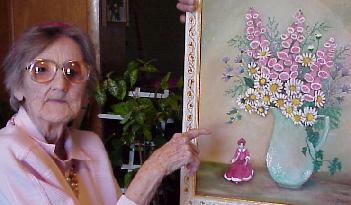 Eva Johnson points to "Foxgloves and Daiseys with Doll"
Born on November 7, 1897, on a farm near Klondike, Indiana, Eva Johnson passed away in February 2002. She was 104 years old. She began painting in the mid 1960's when the woman next door showed her a painting she had done. Johnson is self taught - she has never had an art lesson. Although she loved to sketch and draw as a child, and wanted to study to become an artist, her father nixed the idea. She was about 65 before she picked up a brush in ernest, but it began a career thats lasted over 35 years. Landscapes and flowers are her favorite subjects. Her artwork has ended up in homes all over the United States and been featured in the Ann Nathan Gallery in Chicago. "I'm just glad people are interested in them. I hoped they would be," said Johnson, who considered her paintings part of her family. "I like them. I didn't have any children, so these are my children."